Alaska Occupational Audiology & Health Services (AOAHS) provides comprehensive employee training for each employee as specified in OSHA 1910.95, Federal Railroad Administration (FRA) 49 CFR and MSHA Chapter 62. Hearing conservation training can be achieved through a variety of formats based on your needs. Regardless of the option selected, the training will address all required topics as follows. 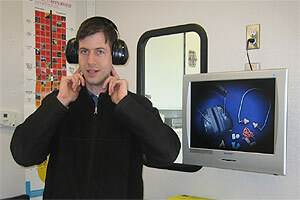 With this option, training occurs in the mobile test unit just prior to the hearing test. Each test group views a video presentation, after which there is opportunity for discussion and questions. The videos used are carefully selected by our staff and new programs are continually added to our library so that employees see fresh material each year. In addition, we incorporate into the training emphasis on a new subject annually, such as non-occupational noise dangers or more specifics in a critical area of hearing loss prevention. This is a 30 minute training session which is performed for a larger group in a classroom setting at your facility. A video or DVD is shown followed by presentation of additional hearing conservation training by a technician or audiologist. This training may incorporate the use of PowerPoint slides or audio demonstrations and can be easily customized to meet your specific interests. It is an excellent choice when you have the ability to gather larger groups of employees together to be trained at one time. With this service, we provide comprehensive, individual training specific to proper use and fit of hearing protection devices. The Hearing Protector Fitting is required one time per employee, and additionally if any standard threshold shifts (STS) are exhibited.